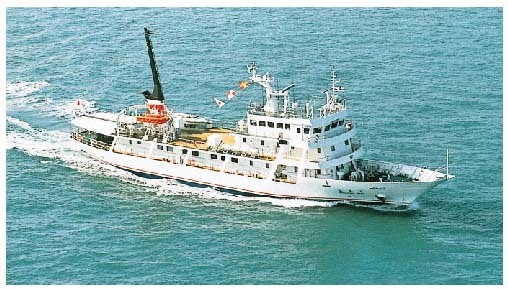 HIROSHIMA MARU was delivered at Kure Shipyard of Ishikawajima-Harima Heavy Industries Co., Ltd. (IHI) in January 1997 to the Hiroshima National College Maritime Technology. She is the most advanced training ship towards the 21st century giving opportunity for students to learn maritime traffic operation or ship handling, machinery operation and ocean scientific researches with highly sophisticated laboratory instruments. 1. The ship has a complete 2nd deck below upper deck. Three tiers of accommodation are featured on upper deck, having wide and quiet lecture room, compact deluxe amenities for trainees and well equipped wide navigation bridge on top. The machineries are widely arranged with intervals for lecture spaces. The engine control room is located near the engine room so that students can keep their eyes on the machineries when using computerized monitoring system. 2. Safety is the most important philosophy in design. Especially for stability, the criteria for passenger ships was applied. 3. A shaft generator is equipped. It can be used as a propelling motor in emergency cases, producing 8 knots. And during normal voyage, it can assist with approx. 200 PS for propulsion. 4. Laboratory instruments on machinery： main engine combustion analyzer, propulsion performance monitor, training switch-boards, COMPLEX (Diesel engine combustion simulator), ADMAX (Ship administration system), engine room monitoring system, etc. are equipped. 5. Data managing system is located in the lecture room, which consists of data acquisition function and ship maneuvering simulator function. It can reproduce ship handling operation for trainees to understand their skill visually. 6. Marine research and training system： STD (Salinity temperature depth recorder), current and water temperature meter, wave height meter, portable type doppler current meter, reflection data processing system, ADCP (Acoustic doppler current profilers), satellite communication system, ship navigation monitoring system, hull momentum sensing system, etc. are equipped. In addition, luxury audio & visual equipment assists teachers and students to enjoy well-organized lectures.